OACB is a full-service trade association providing advocacy, communications, professional development, and technical assistance to the board members and staff at Ohio's 88 county boards of developmental disabilities. The vast majority of online resources for members can be found within MemberConnect, the association's member services portal. Below is a listing of all resources available with direct links to the appropriate section of the service. A MemberConnect account is required to access member services. If you are an OACB member, you can sign up for an account here. Questions? Contact Adam Herman (aherman@oacbdd.org) at 614-431-0616 ext. 7997 to learn more. OACB is proud to offer a comprehensive manual pertaining to issues of importance to the seven governing board members and senior management staff at county boards across the state. 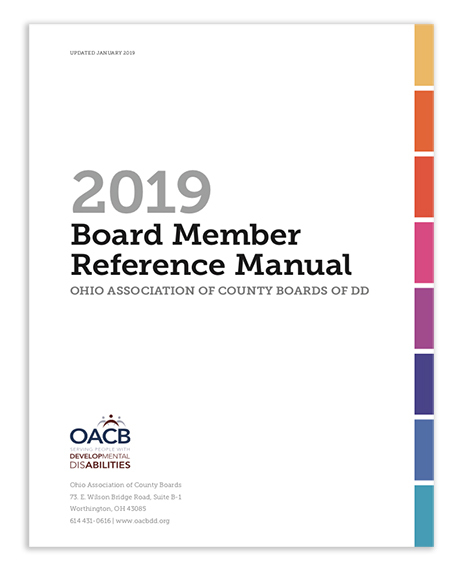 Updated annually, OACB's Board Member Reference Manual is a go-to resource for county board members seeking basic information about a wide variety of topics in Ohio's developmental disability service delivery system. A complete PDF copy of the Board Member Reference Manual can be downloaded via the Document Center of OACB MemberConnect – to download a PDF of the manual, click here (download will start immediately upon log-in). Individual sections of the Board Member Reference Manual may also be downloaded within the Board Members tab of the MemberConnect Document Center (login required). Member services are available 24 hours a day, 7 days a week through OACB's online member services portal at www.members.oacbdd.org. A brief description of some of MemberConnect's features is below. Note that this list is not comprehensive. To access these services, simply click on the image below (login required) or visit www.members.oacbdd.org and use the navigation menu therein. For technical support with MemberConnect, including login issues, please contact Lana Beddoes at lbeddoes@oacbdd.org or (614) 431-0616 ext. 7988. The Member Directory is a searchable, members-only contact database that contains the phone numbers and email addresses of thousands of board members and staff at Ohio's county boards of DD. Members can search for and download contact information as an address book contact file (vCard). Questions? Contact Lana Beddoes at lbeddoes@oacbdd.org. The Document Center is an online storage center where OACB members can download important information such as policy documents, conference presentations, and other important materials from any internet-connected computer. Members can also request the inclusion of documents they think would be useful to their colleagues. Questions? Contact Adam Herman at aherman@oacbdd.org. Attending an OACB event has never been easier thanks to the MemberConnect Events Manager. By integrating members' contact information directly into a one-stop event registration, check-in, and Continuing Professional Development Unit (CPDU) interface, members can manage their ongoing training needs with the click of a button. Questions? Contact Erich Hiner at ehiner@oacbdd.org. Are you looking for a job in Ohio's DD system or seeking the perfect candidate for an opening at your organization? OACB's Job Bank provides unmatched access to candidates and open positions at county boards and affiliate member organizations. Postings are free for boards and $49 for non-members. Affiliates receive a set number of free postings per year. Questions? Contact Erich Hiner at ehiner@oacbdd.org. OACB's Listservs allow county board of DD professionals to communicate with their counterparts across the state without even leaving their email inboxes! Simply sending an email to a listserv address will get one in touch with other professionals in similar roles across Ohio—allowing for easy collaboration and communication between counties. Questions? Contact Erich Hiner at ehiner@oacbdd.org. Over the years, OACB attorneys have weighed in on many pressing legal questions related to county board governance, rule compliance, personnel matters, and more. The Legal Library allows members to access this catalog of legal opinions for board use at no direct cost. Opinions can be searched and sorted by year, topic, and more. Questions? Contact Adam Herman at aherman@oacbdd.org. County boards of DD rely on the support of local tax levies to fund critical programs for Ohioans with developmental disabilities. OACB's County Levy Reporting tool inside MemberConnect allows users to see active levies, collection rates, and expiration dates in an easy-to-understand format to help with long-term financial planning and projections. Questions? Contact Rick Black at rblack@oacbdd.org.